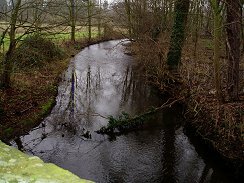 I walked this link of the Hertfordshire Chain Walk on 8thJanuary 2006 - the first walk of the year. Once again I parked at Little Berkhamsted in a small layby opposite the Five Horshoes Pub. However this time I headed up the road, past St Andrews church and on into Breach Lane. 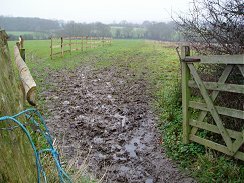 From Breach lane the path turned left and went across a rather boggy and waterlogged field, Photo 1. The path then headed between fields towards Howe Green. On the way the path passed a very large, newly built house. One of a suprisingly large number of huge houses that are dotted around the countryside and I often wonder who it is that lives in them and what they do. From Howe Green the path crosses a field and heads down towards a surfaced track that leads to the B158. 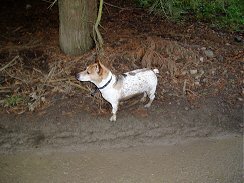 As I walked this stretch I was accompanied by the small dog in photo 2, which had very unual markings, particularly a rectangular patch of brown fur on the back of his neck. Whilst he was a nice companion I was pleased when he finally decided to turn round and head back as I didn't really want him going along the road with me. 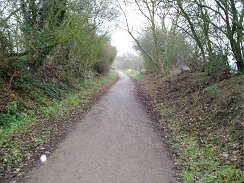 The route of the path crosses the B158 and heads up a road towards Letty Geen. Just after the B158 junction the road crosses over the River Lea, photo 3. Although there were no pavements or verges to walk on the road was not very busy on the Sunday morning when I walked it and for most of the route visibility was reasonably good. From Letty Green the path takes a short footpath between houses from Chapel Lane to the route of the Cole Green Way, part of an old railway line that ran between Hertford and Welwyn Garden City, which is reached by crossing over an old concrete stile, photo 4. 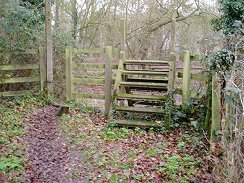 The Hertfordshire Chain Walk now shares a short part of its route with the Lea Valley Walk. 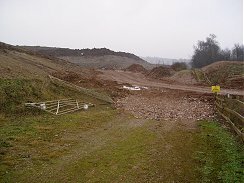 Photo 5 shows the remains of the platform at what used to be Letty Green station which is just off the route of the Hertfordshire Chain Walk. When I had walked this part of the Lea Valley Walk recently I was convinced that the route as marked on the Ordnance Survey map had been re-routed. As I was back in the area I decided to investigate so left the Hertfordshire Chain Walk at this point and headed down the Lea Valley Walk. I did successfully find the revised route of the Lea Valley walk and the diversion added about 3.25 miles to the length of the walk before I got back to Letty Green and resumed my walk along the Hertfordshire Chain Walk on the Cole Green Way, photo 6, which is followed for a short distance before the path turns off over a field in the direction of Roxford farm. On the way to Roxford farm the route of the path passes a vast area of landfill. From what I could gather I think the area had been quarried in the past and the landscape was gradually in the process of being reinstated. 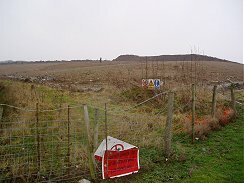 In some places the land appeared to have been completly reinstated, elsewhere there was soil without much greenery growing, photo 7, and in others tipping was still actively taking place, photo 8. Along one section of the path on the approach to Grotto Wood near where photo 7 was taken there was a very strong smell of gas coming from the ground although I have no idea what sort of gas it was. Although it does not sound very pleasant I found this was a very interesting area to pass through. 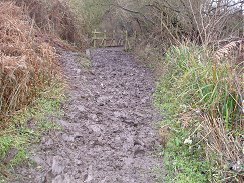 The only real problem I encountered was crossing the track in the middle of photo 8, which consisted of ankle deep mud churned up by the lorries going to the tip which left my boots completly covered in sticky mud. As I reached the top end of Grotto Wood I was forced to stop and dig my waterproof coat out the depths of my rucksack as the earlier drizzle had turned to heavier rain. 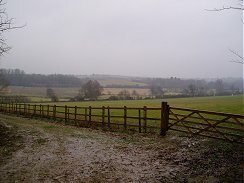 Walking down the side of Grotto Wood there was a good view across the farmland over the Lea Valley, photo 9, although this was rather obscured by the rainy weather. 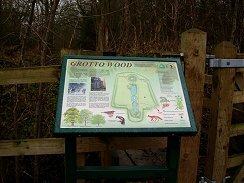 Outside Grotto Wood there was a small noticeboard, photo 10, giving the history of the site which many years ago once contained a formal garden complete with a grotto although these are now long gone. From Grotto Wood the path heads down towards the River Lea and then makes it way towards Water Hall Farm, which despite its name contains an active quarry. 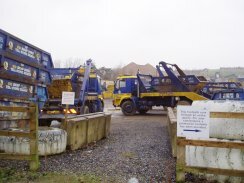 There was also plenty of evidence of more landfill and also a skip hire business, photo 11, which seemed to be linked to the quarry which can just be seen in the background. 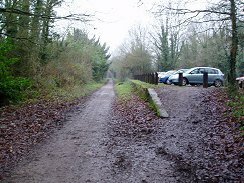 The Hertfordshire Chain Walk path crosses the River Lea over a bridge that forms part of the entry road to Water Hall Farm complex before crossing the B158, heading past one final area of landfill and going up a very muddy bridleway, photo 12, which heads towards Great Stockings. 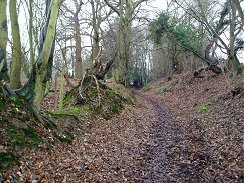 The path passes through a patch of woodland and goes along a old green lane, photo 13, that eventually joins a minor road which leads past a few houses to Robins Nest Hill road. This road is then followed back to Little Berkhamsted. This section of road was quite busy and once again did not have a footpath to wallk along. 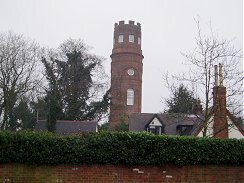 On the way the road passes Stratton's Observatory, photo 14, a 100ft high tower built in 1789. Unfortunatly it was hard to find a clear view of the entire building which seems to be a private house. The GPS made this walk 9.09 miles long although the actual length of the Hertfordshire Chain Walk was just 5.84 miles, the rest of the distance comprising my detour along the Lea Valley walk.